Remember what life was like before your iPhone? Before there were palm-sized smartphones with seemingly endless features, there were phones like Motorola’s RAZR that peaked with its embedded camera. Before that, there were simple flip phones with texting capabilities, bulky two-pound Gordon Gekkos—even briefcase phones. Mobile phones have come a long way in the last 70 years, so be thankful yours fits in your pocket. Maybe one day it will even be able to bend like a piece of thin plastic. Maybe you won’t even have to touch it, doing all of your multitasking from cellular implants. 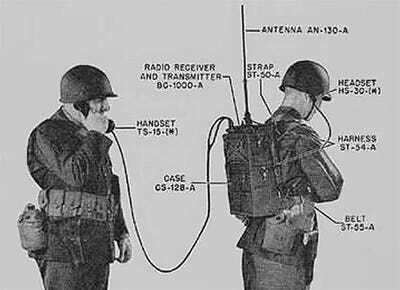 But 70 years ago, you’d be lugging a 25-pound ‘portable’ phone on your back, with very limited 5-mile range. 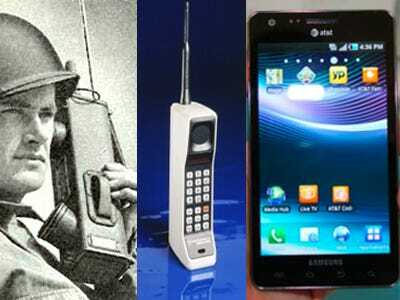 And now, a visual history marking the accomplishments of mobile phones, from military applications to mobile apps. Alexander Graham Bell would surely be proud. 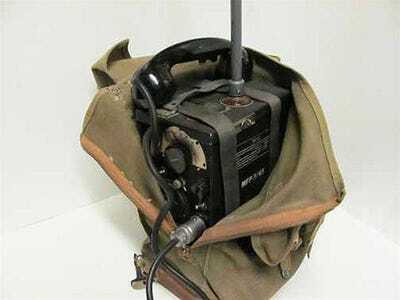 Not quite what you would consider a mobile phone, the SCR-194 and 195 were the first portable AM radios, produced by the U.S. Army Signal Corps Engineering Laboratories in Fort Monmouth, NJ. Considered the first 'walkie talkie,' these devices weighed roughly 25 pounds and had a 5-mile range. They were widely used for infantry battalion and company intercommunication during World War II. 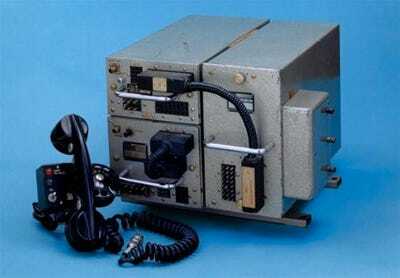 Next came the SCR-300 radio transceiver, developed for the U.S. Military by Motorola. This time a portable FM radio, it weighed anywhere from 32 to 38 pounds with a 3-mile range. 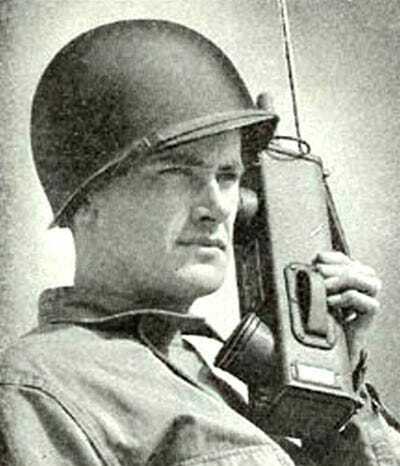 Motorola produced the first 'handie talkie' for the U.S., labelled SCR-536. 130,000 units were manufactured and used during the war. Back to AM, this handheld version shed the fat off the previous two transceivers, weighing only 5 pounds. But its land range was only 1-mile (3 miles over water). 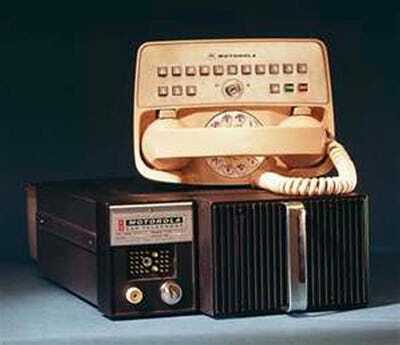 Bell System introduced the first commercial mobile telephone service, called the Mobile Telephone System (MTS). 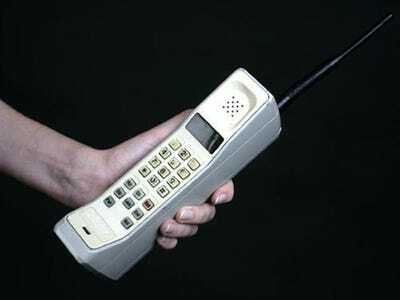 The original equipment was large, weighing 80 pounds (not quite what you'd call mobile) with limited calling bands available from AT&T. The service wasn't cheap either--costing $30 a month (roughly $330 today) with additional per call charges. Not really intended for regular Joe Blows, these devices were used by utilities, truck fleet operators, and reporters. 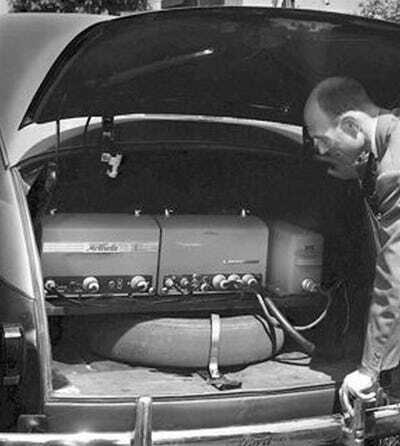 Ericsson's Mobile System A (MTA) was the first partly automatic mobile system for automobiles. First used by Sweden, the unit weighed a whopping 88 pounds. Again, 'mobile' is kind of a misnomer, considering it's equivalent to almost 300 iPhones! With the adaption of Bell's newer pre-cellular Improved Mobile Telephone Service (IMTS), auto owners saw lighter, more advanced mobile car phones with push buttons. This one by Motorola weighed 40 pounds, half as much of the original units from the '40s. Over the years, they managed to get down into the 20-pound range. But they never managed to get into the hands of Joe Blow, with a still-hefty price and rationed service throughout the nation. With a prototype of the DynaTAC (DYNamic Adaptive Total Area Coverage) portable phone, former Motorola Vice President Martin Cooper made the first private, practical mobile phone call in a non-vehicle setting. Who'd he call? His rival at Bell Labs, Joel S. Engel. With the impressive size of the DynaTAC prototype, it's disappointing to see Nokia's Mobira Senator weighing in at 22 pounds. It launched during the world's first fully automatic international cellular service--NMT--the first-generation (1G) of mobile communications. 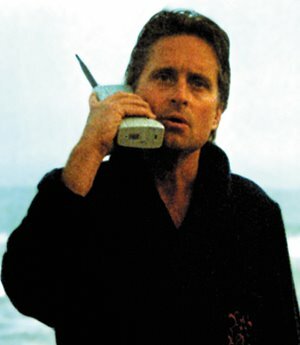 10 years later after the prototype, Motorola's DynaTAC cellular phone was made available to the public, weighing under 2 pounds, but costing nearly $4,000 (almost $9,000 today)--which is why it was strictly for the Gordon Gekkos of the world. It worked on AMPS, North America's first 1G analogue service, launched first by Ameritech in Chicago. Back to larger mobile devices, the Mobira Talkman brought longer talk time at cheaper costs. The DynaTAC could only manage 60 minutes of talk time, but this miniature beast gave hours or voice-to-voice communication. 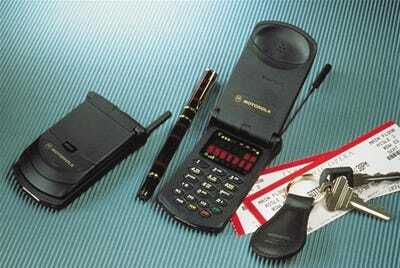 Next up was Motorola's MicroTAC, which introduced the first flip phone design. The hardware was place in a hinged section of the phone, reducing the phone's size when not in use. It was truly the world's first pocket phone. 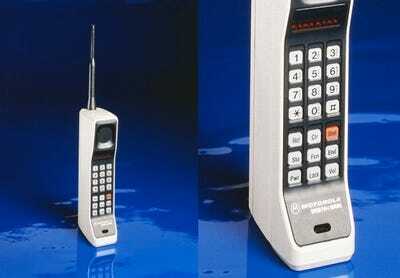 The Motorola International 3200 became the first hand-sized digital mobile phone that used 2G digitally encrypted technology (unveiled in 1991 as GSM). 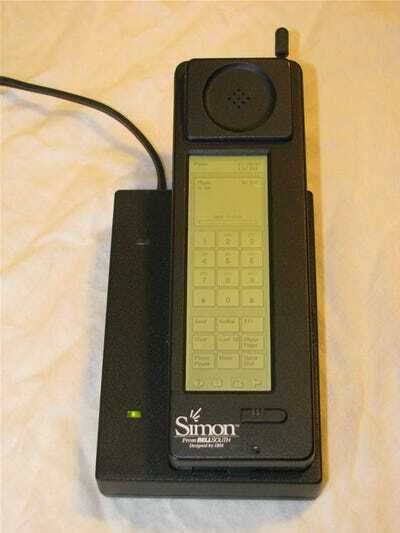 Perhaps the world's first smartphone, IBM Simon was a mobile phone, pager, fax machine and PDA, all rolled into one. 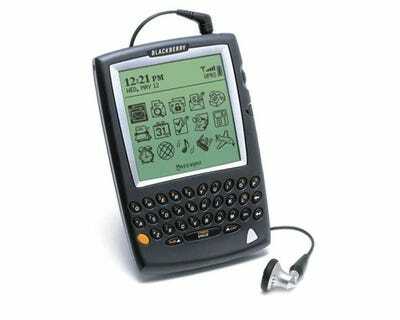 It included a calendar, address book, clock, calculator, notepad, email, gamers and a touchscreen with QWERTY keyboard. It originally sold for $899, which would be just over $1,300 nowadays. You may remember Simon from Sandra Bullock's The Net. 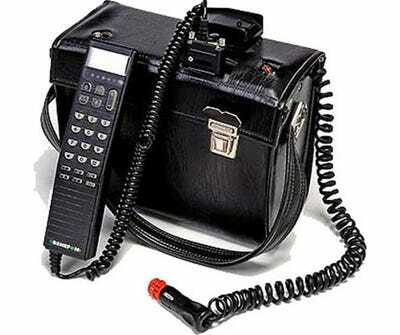 Car phones remained popular, despite their smaller pocket-sized versions, but Motorola's Bag Phone (2900) was the car phone to have due to its long talk time, great battery life and superior signal range. They first worked with 1G networks, but eventually crossed over into 2G territory. 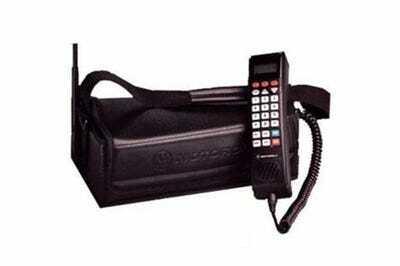 Still shrinking the line of TACs, Motorola unveiled the first clamshell mobile phone with StarTAC. It improved the folding feature by collapsing in half, which is why it's called 'clamshell'--because it resembles a clam opening and closing shut. It ran on 1G networks, but eventually crossed over into the world of 2G. It's said to be inspired by the communicator from the original Star Trek series. The Simon was good, but the Nokia 9000 Communicator was what really brought on the smartphone era. 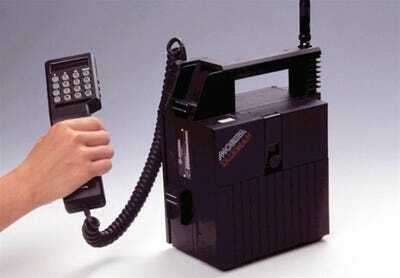 It was the first cell phone that could also be called a mini-computer (though it had limited web access). 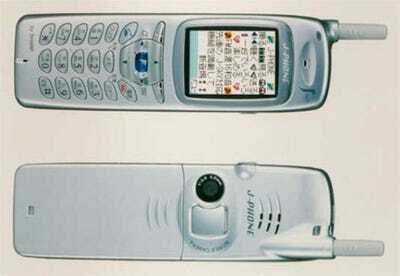 When opened, the longways clamshell design revealed an LCD screen and full QWERTY keyboard--the first on a mobile phone. 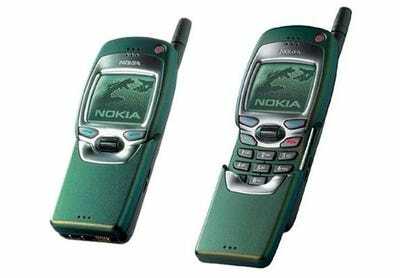 The Nokia 8810 was the first cell phone without an external antenna whip or stub-antenna, possibly paving the way for iPhones and DROIDs. 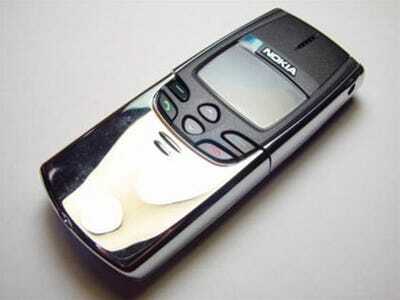 It also made mobile phones more aesthetically pleasing, with its sliding keypad cover. 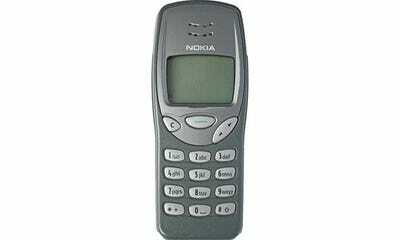 One of the most popular mobile phones in history was the Nokia 3210, with over 160 million sold. It was one of the first to allow picture messages, but only preinstalled ones like 'Happy Birthda,y' and was one of the first to be marketing toward young people. 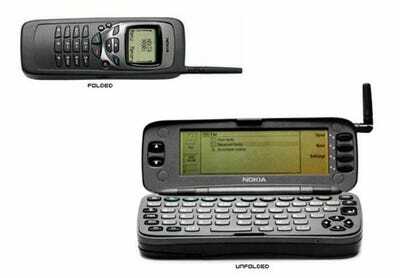 Nokia's 7110 was the first cell phone to incorporate Wireless Application Protocol (WAP), which gave mobile users web access for simple devices--a stripped-down, mostly text version, but a revolutionary step for mobile internet. 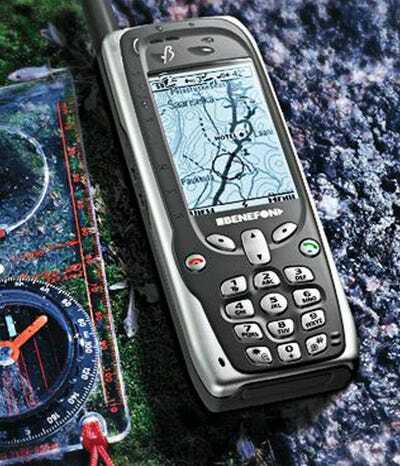 GeoSentric was responsible for the world's first mobile phone and a GPS navigator integrated in one product--the Benefon Esc! It was splashproof, greyscale, and allowed users to load maps to trace position and movement. 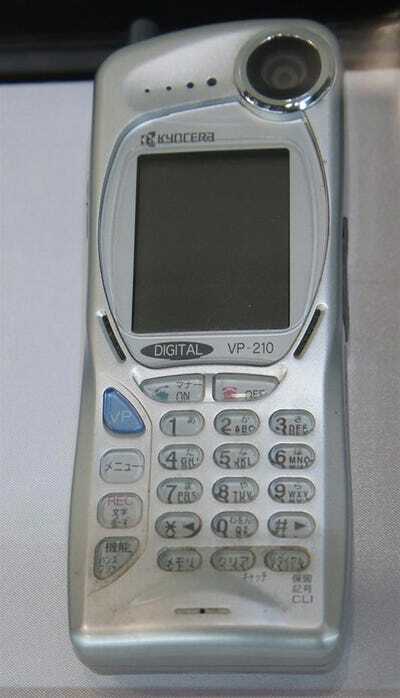 Sharp was first to the camera phone market with their J-SH04 (J-Phone), released by J-Mobile in Japan. 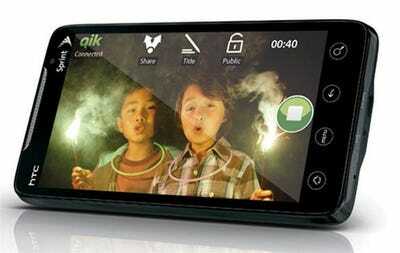 It offered a mere 0.1 megapixel resolution. Some like to give credit to Olympus for being the first camera to transmit digital images over a cellular network with their Deltis VC-1100. Others prefer Philippe Kahn's story of rigging up a camera to a cell phone with wires to send images of his newborn baby. But the J-SH04 was the first commercially available cell phone to have an integrated CCD sensor, with the Sha-Mail (Picture-Mail) infrastructure. This was the start of what we know as MMS. 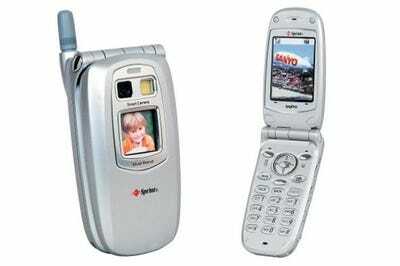 Not too far from the J-Phone, the Sanyo 5300 from Sprint was the first camera phone sold in North America. 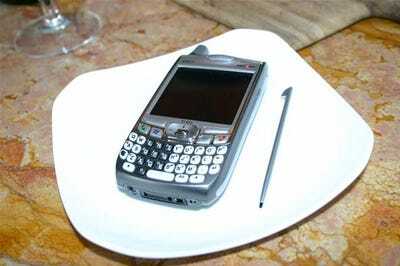 RIM's BlackBerry 5810 wasn't the first BlackBerry device, but it was the first to incorporate a mobile phone into their popular brand of data-only devices. Professionals who needed immediate access to their emails and schedules were the main target for RIM, but the built-in phone made it appealing to everyone. The downside? No speaker or microphone. 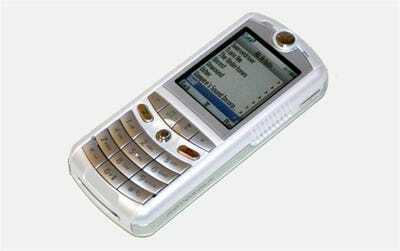 One of the first phones to equip a fully functional web experience and integrate an instant messaging client (AIM) was the Danger Hiptop in 2002, later re-branded the T-Mobile Sidekick. 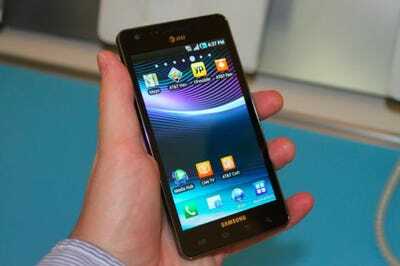 Its messaging features and keyboard made it one of the best selling phones in the deaf community. Also new was an LCD screen that rotated and flipped to reveal a large QWERTY keyboard. 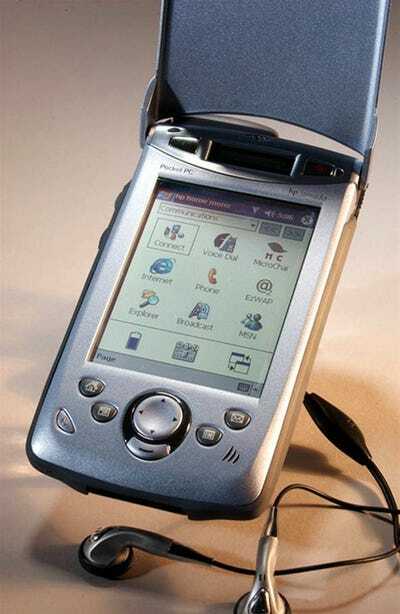 Perhaps surpassing the BlackBerry achievements, Microsoft's Pocket PC Phone Edition started spreading across PDAs like wildfire, including the HP Jornada 928 Wireless Digital Assistant, combining the best of the PDA with integrated wireless voice and data capabilities. It was a nice addition to the older Windows Mobile Classic devices, which essential ran a mini-version of Windows XP. 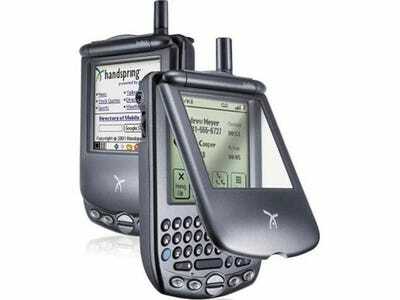 Another PDA adding phone support was Palm's Treo 180 by Handspring, running the Palm OS. 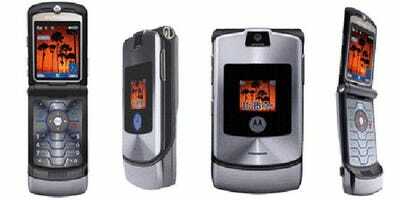 The next highly popular device was a camera phone called the Motorola RAZR, which was first marketed as a 'fashion' phone in 2004, selling 50 million units by mid-2006. 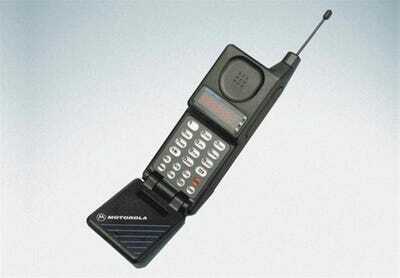 It helped give cell phones a new look, which were getting stale with the same ol' boring designs. Though nothing revolutionary, its looks did more than impress. 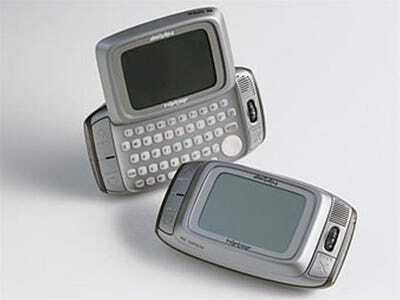 The first Palm smartphone to operate outside of the Palm OS was the Treo 700w, powered by Windows Mobile. It was a great alternative for users who needed access to Microsoft software on the go. 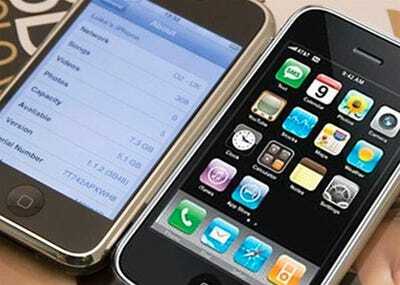 In 2007, Steve Jobs introduced the Apple iPhone, a revolutionary touchscreen smartphone. It wasn't the first smartphone, but it was the first to get the user interface right, eventually adapting 3G technology (which was already available since 2001). 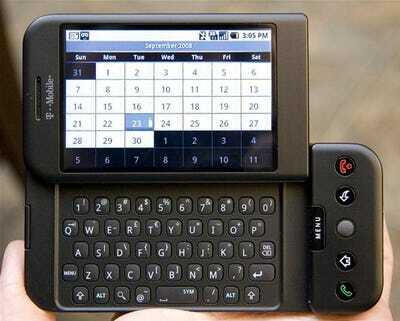 The first smartphone to run Google's Android OS was the HTC Dream slider smartphone. It featured a QWERTY keyboard, full HTML web browser, Gmail, YouTube and more, and paved the way for phones like the Nexus One and Motorola DROID. The HTC EVO 4G from Sprint was the first cellular phone to meet 4G standards, running on the WiMAX network. It was sold powered by Android 2.1 and had one of the largest touchscreen displays, an 8MP camera, HD video capture, HDMI output, Mobile Hotspot capability and HTC Sense.